July 14 – A month ago, it was Iraq and Ukraine. Three weeks ago, it was all about Iraq–and seemingly the entire Middle East. 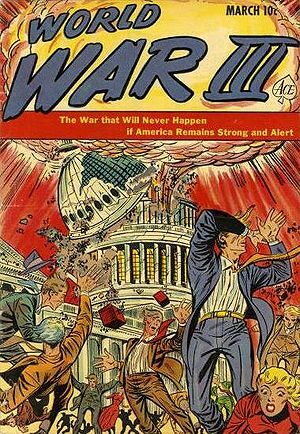 THIS WEEK: All is quiet on the World War 3 Watch front. In fact, it’s been so quiet that WW3 Watch took last week off. Easy. There were no new World War 3 headlines in any major media–or even minor/alternate media for that matter–for over a week. The headlines have only just recently returned. While the world will end up eventually in World War III, the past two weeks it was relatively quiet the world over. After pressing Iran as a partner for the USA, the press has quieted down on that narrative. Ukraine has slipped out of the daily news, though reports of violence spilling over into Russian-controlled territory formerly called the Ukraine popped up this weekend. ISIS is still moving. Iraq is still falling. Ukraine is still bubbling. Israel and Palestine are still calling each other names. Palestine has become the launching pad for rockets. Israel, predictably, is retaliating. Will Current Israeli-Hamas conflict ignite World War III? Ukraine – has been quiet. Actions by the Ukrainian government troops still ongoing. Could flare up without warning. There’s a 33% chance of World War III; which is UP 2%. Actually, a lot of Americans are suckers for anything deemed “historic” by the Corporate Media. Over the next two weeks, expect media pieces connecting the events of 2014 with the events of 1914. A continued chance of a domestic terror attack [+67%] leading to war in the Middle East before October 2016. Continued talk in the media of a Muslim terror attack raises the chances of a domestic terror attack 2% over the last week. Israel – up slightly after air strikes in Syria about a few weeks ago. Military sweeps through Palestinian-controlled areas will get much media coverage. July 14, 2014 – At the halfway point in July 2014, the world is not so violent as it appeared to be just a few months ago. Which is not the same thing as a safe place. That what we said two weeks ago, and sure enough: violence in Israel and Ukraine have flared up. The world is still relatively quiet. Which doesn’t mean anything as far as speculation about the future is concerned. Enjoy the relative peace for at a little while longer.